Saint Sapphire emerged from a place in between the Indie and Punk movements from Belfast, Northern Ireland, making upbeat songs with a hard edge, but with their own streetwise swagger, unique musicality and infectious hooks. The songs are full of anthemic choruses mixed with veritable aggression, angst and anger all topped off with huge amounts of frustration that have led them to being described by one US commentator as reminiscent of an early Clash mixed with The Who. Lead songwriter and frontman Sam Morgan’s performances on stage have often been likened to that of a young Pete Townsend. The band is made up of four lads from across Northern Ireland, frontman/guitarist Sam Morgan, drummer Adam Walker, lead guitarist Danny Martin and bassist Shea McAuley. Having gained the attention of BBC Introducing, RTE Radio in Dublin and many more, the bands following continues to grow rapidly, with their debut England show headlining The Water Rats in London in February 2018 being a tour de force, followed by a return to London at the Rocksteady in Dalston last June. In amongst requests to tour Europe and the USA, the band are also planning a UK tour. 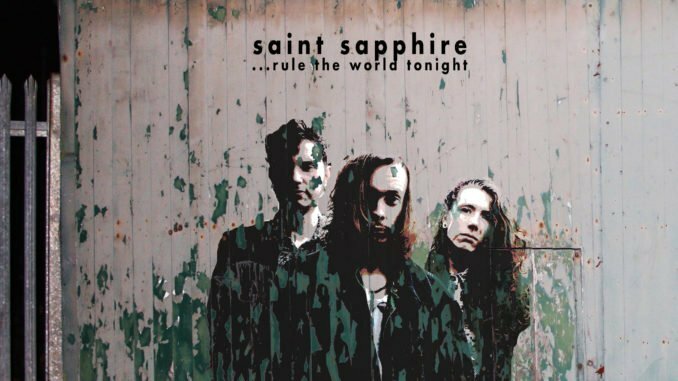 Saint Sapphire have been bringing their sonic assault to the people of Ireland and the UK firmly on their own terms, now it’s time for the rest of the world to hear them and their stunning new single ‘Rule The World Tonight’, TURN IT UP!